One of the five main ghettos created by Nazi Germany during their occupation of Poland in WWII. 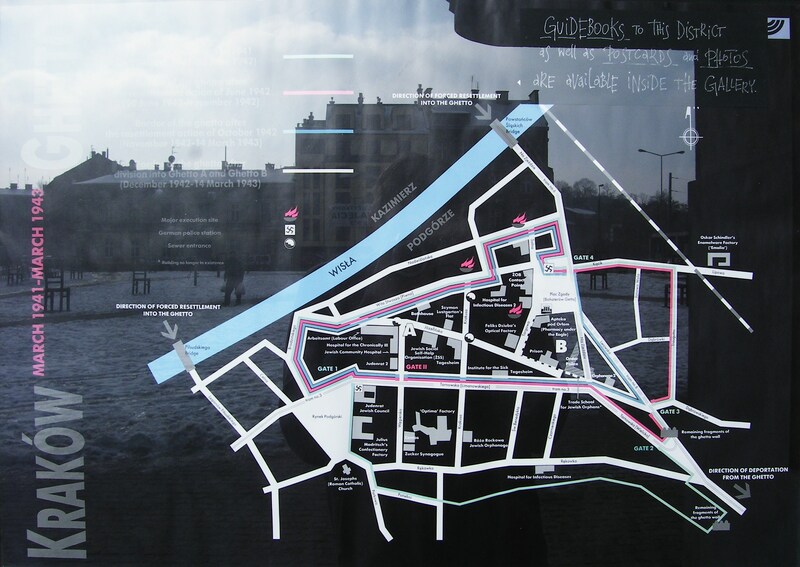 Before the war, the city was an influential cultural centre for the 60,000 – 80,000 Jews that resided there. KRAKOW TOURS — The diary of a child who survived four different Nazi concentration camps during World War II has finally been published. Helga Weiss, now 83, was one of only 100 children to survive Auschwitz out of the 15,000 sent there from the concentration camp in Terezin, north of Prague. She and her mother were sent to four different camps between 1941 and 1945: Terezin, Auschwitz, Freiberg and Mauthausen. The diary she kept during those years, drawing and writing the scenes she observed and experienced, begins to tell the story of an 8-year-old girl experiencing air raid alarms, the expulsion of Jewish children from school and the sewing of yellow Stars of David on clothing. When Weiss was 12, she was sent with her family to Terezin, which was essentially a transit hub for Jews that would be sent to Auschwitz and Treblinka. via Diary of child who survived Auschwitz finally published | ksl.com. Reports by a Pole who got himself imprisoned in Auschwitz during WW II to see what conditions were like inside the Nazi death camp have won the prestigious THE PROSE award in the US. Captain Witold Pilecki’s reports, published by the independent Aquila Polonica publishing house in the United States, received the award from the Association of American Publishers, which brings together over 300 large American publishing houses. Pilecki’s reports, ‘The Auschwitz Volunteer: Beyond Bravery’, was awarded in the ‘biographies and autobiographies’ category. The book has also been named Editor’s Choice by the New York Times. Captain Pilecki’s reports have been translated by Jarek Garliński, the son of the historian and Auschwitz prisoner Józef Garliński. The 400-page book has an introduction by the renowned historian Norman Davies and a foreword by Michael Schudrich, Chief Rabbi of Poland. In September 1940 Witold Pilecki volunteered to be captured and imprisoned in Auschwitz to bring out the story of German atrocities. In 1943 he escaped from the camp, reached Warsaw and a year later fought in the Warsaw Rising. After the war he went to Italy and joined the Second Corps but was subsequently sent by the Polish intelligence to Poland as a spy. However, he was captured and executed by the communist authorities in 1948. He was rehabilitated in 1990 and in 2008 received posthumously the Order of the White Eagle, the highest Polish state distinction. I didn’t take too many pictures at the museum as it was incredibly dark inside and really didn’t lend itself to photography layout wise, but what few I did are displayed in this small sub-gallery. via Oskar Schindler’s Factory Photo Gallery by Helen Betts at pbase.com. Polish Police try to catch a runaway pig. As powerful beams of light revealed the new arrivals at Auschwitz, the SS guards could scarcely believe their eyes. One by one, seven tiny people were lifted off the train. Five were women — each no taller than a girl of five, yet wearing make-up and elegant dresses. They looked like painted dolls. Huddled together in a circle, the seven dwarfs made no attempt to join the teeming mass of passengers being herded up a ramp by soldiers with alsatians straining at the leash. Instead, one of the male dwarfs started handing out autographed cards to the guards who surrounded them. After all, it couldn’t hurt for them to know the Lilliput Troupe was famed internationally for its variety shows. Like most of the Hungarian Jews on the train, which had taken three days to arrive at Auschwitz-Birkenau, the dwarfs had no idea they’d just been deposited in the Nazis’ most notorious extermination camp. An SS officer strode over and established they were all siblings from the Ovitz family. Immediately, the order went out: Wake the doctor! via How the seven dwarfs of Auschwitz fell under the spell of Dr Death: The hideous experiments carried out by Nazi Josef Mengele on seven trusting brothers and sisters | Mail Online. Valentine’s Day is being celebrated in Poland, with pastry chefs across the country rustling up suitably romantic confections. As with Halloween,Valentine’s Day passed virtually unnoticed in Poland until the fall of the Iron Curtain in 1989. However, in the last ten years in particular, the celebrations have become increasingly popular, especially with young Poles. The picturesque medieval town of Chelmno, northern Poland, has thrown itself into the Valentine’s Day spirit with particular gusto. A relic of St Valentine that was donated to the Church of St. Mary in 1630 – but largely forgotten until 2002 – has inspired an annual extravaganza on 14 February. The municipal authorities have even gone so far as to re-brand Chelmno as “the town of the enamoured” in its official slogan. Elsewhere in the country, flower-sellers, chocolatiers, restaurateurs and hoteliers are all doing a roaring trade. For many, the everlasting power of Auschwitz is understood only by visiting the infamous death camp and walking the grounds where more than 1 million people were killed during the Holocaust. The problem, according to two local architects, is in assuming the camp itself will be everlasting. As survivors continue to die and the camp’s structures continue to decay, there remains the question of how and what to preserve of Auschwitz, and how visitors — currently more than 1 million annually — will interact with the site in the years and centuries to come. via Preserving Auschwitz? | Los Angeles | Jewish Journal. Wieliczka Salt Mine is probably the most amazing mine in the world. A very popular destination, the mine is located just east of Krakow and has been the driving force behind the city’s former wealth and influence. The mine has been producing salt for 700 years and now stretches to over 200km of tunnels over 9 levels. Guided tours are compulsory – these are run regularly in English as well as less often for other languages. The tours last at least two hours – up to three in the busiest times of year – and involves a 2km walk through the mine, beginning with a dizzying 378 step descent down one of the shafts to the third level. The mine was carved out by hand and is a maze of tunnels and chambers. Some of the wooden pit props are so old that with the weight of the ground above have compressed to the hardness of stone. The whole area is eerily lit, with the salt crystal walls surprisingly dark. Narrow tunnels lead to huge chambers, some with other entrances way above accessed by catwalk. The pit props are at times like a work of art, holding up the ceiling like a vaulted cathedral. Statues line the route, all carved from salt in intricate detail as the tour take you deeper in to the mine. The highlight of the tour is the Chapel of the Blessed Kinga, patron saint of Poland. One of several chapels set in the mine complex, the entire chamber was hewn by hand from solid rock salt. This underground temple took over 30 years to complete and involved the removal of of 20,000 tonnes of rock salt. Everything in the room is made of salt, including the chandeliers and altarpieces. The pulpit is carved as a mountain with a castle wall, while carved panels depict Christian scenes in great detail. 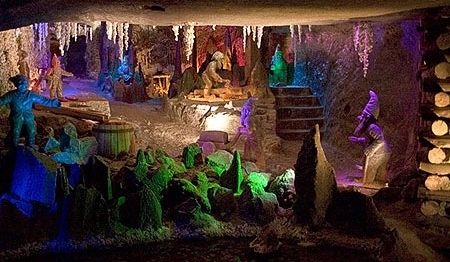 The Wieliczka Salt Mine is truly a unique place to visit – from the slow descent and maze of passageways to the huge vaulted chambers and speedy ascent in the lift. The Chapel of Blessed Kinga is truly stunning, a massive cathedral set a hundred metres underground. via Wieliczka Salt Mine – Poland – Country Guide. I’m often asked about the cost of living in Poland, I’ve found a great website where you can compare any 2 cities. Here’s a sample comparing Krakow to where I used to live, Leeds. Krakow has broken into the top 10 of the world’s most attractive locations for outsourcing investments. According to the 2013 edition of Top 100 Outsourcing Destinations, an annual report by Tholons, a global strategic advisory firm. The city moved up one notch to be ranked 10th in the world, thus becoming the first destination from Eastern Europe ever to make the company’s Top 10 Emerged Cities list. Two other Polish cities were ranked in Tholons’ Top 100 list. Warsaw climbed two notches to 36th, whereas Wroclaw jumped up three places to 75th. via Krakow enters global top 10 of outsourcing destinations – Investments – Business Portal for Poland. Or if you prefer a hard copy, order below. FRIDAY – Karaoke with Mikey! SATURDAY – Live music with THE BEERTONES! !